This section is intended to permit state-licensed physicians to recommend marijuana for medical purposes to patients with serious illnesses and medical conditions. The section allows patients with qualifying medical conditions the right to discuss freely with their physicians the possible benefits of medical marijuana use. the right of their physicians to provide professional advice concerning the same. and the right to use medical marijuana for treatment under the supervision of a physician. This section is intended to make only those changes to Missouri laws that are necessary to protect patients. their primary caregivers. and their physicians from civil and criminal and to allow for the limited legal production, distribution. sale and purchase of marijuana for medical use. This section is not intended to change current civil and criminal laws governing the use of marijuana for nonmedical purposes. The section does not allow for the public use of marijuana and driving under the influence of marijuana. “Administer” means the direct application of marijuana to a Qualifying Patient by way of any of the following methods. (g) Any other method recommended by a Qualifying Patient’s physician. (2) “Department” means the Department of Health and Senior Services. or its successor agency. (3) “Entity” means a natural person. corporation. professional corporation, nonprofit corporation, cooperative corporation. unincorporated association. business trust. limited liability company. general or limited partnership. limited liability partnership. joint venture. or any other legal entity. (4) ‘Flowering plant” means a marijuana plant from the time it exhibits the first signs of sexual maturity through harvest. (5) “Marijuana” or “Marihuana” means Cannabis Indica, Cannabis sativa, and Cannabis ruderalis. hybrids of such species. and any other strains commonly understood within the scientific community to constitute marijuana. as well as resin extracted from the plant and marijuana-infused products. “Marijuana” or “Marihuana” do not include industrial hemp containing a crop-wide average tetrahydrocannabinol concentration that does not exceed three-tenths of one percent on a dry weight basis. or commodities or products manufactured from industrial hemp. “Marijuana-infused Products” means products that are infused with marijuana or an extract thereof and are intended for use or consumption other than by smoking, including. but not limited to. edible products. ointments. tinctures and concentrates. Marijuana Dispensary Facility, Medical Marijuana Testing Facility. or to a Medical Marijuana-Infused Products Manufacturing Facility. “Medical Marijuana Dispensary Facility” means a facility licensed by the Department. to acquire. store. sell. transport. and deliver marijuana marijuana-infused products. and drug paraphernalia used to administer marijuana as provided for in this section to a Qualifying Patient. a Primary caregiver. another Medical Marijuana Dispensary Facility- a Medical Marijuana Testing Facility. or a Medical Marijuana-Infused Products Manufacturing Facility. (2) “Medical Marijuana-Infused Products Manufacturing Facility” means a facility licensed by the Department. .to acquire. store, manufacture. transport. and sell marijuana-infused products to a Medical Marijuana Dispensary Facility. a Medical Marijuana Testing Facility, or to another Medical Marijuana-Infused Products Manufacturing Facility. “Medical Marijuana Testing Facility” means a facility certified by the Department. to acquire. test. certify. and transport marijuana. “Medical use” means the production, possession. delivery. distribution. transportation. or administration of marijuana or a marijuana-infused product. or drug paraphernalia used to administer marijuana or a marijuana-infused product. for the benefit of a Qualifying Patient to mitigate the symptoms or effects of the patient’s qualifying medical condition. (12) “Physician” means an individual who is licensed and in good standing to practice medicine or osteopathy under Missouri law. CJ3) “Physician certification” means a document. whether handwritten. electronic or in another commonly used format. signed by a physician and stating that. in the physician’s professional opinion. the patient suffers from a qualifying medical condition. “Primary caregiver” means an individual twenty-one years of age or older who has significant responsibility for managing the well-being of a Qualifying Patient and who is designated as such on the primary caregiver’s application for an identification card under this section or in other written notification to the Department. In the professional judgment of a physician. any other chronic, debilitating or other medical condition. including. but not limited to- hepatitis C.
amyotrophic lateral sclerosis, inflammatory bowel disease. Crohn’s disease. Huntington’s disease. autism. neuropathies- sickle cell anemia. agitation of Alzheimer’s disease. cachexia. and wasting syndrome. “Qualifying Patient” means a Missouri resident diagnosed with at least one qualifying medical condition. Grant or refuse state licenses and certifications for the cultivation manufacture. dispensing, sale. testing. tracking. and transportation of marijuana for medical use as provided by law: suspend. fine, restrict. or revoke such licenses and certifications upon a violation of this section or a rule promulgated pursuant to this section: and impose any administrative penalty authorized by this section or any rule promulgated pursuant to this section. Promulgate rules and emergency rules necessary for the proper regulation and control of the cultivation- manufacture. dispensing. and sale of marijuana for medical use and for the enforcement of this section so long as patient access is not restricted unreasonably and such rules are reasonably necessary for patient safety or to restrict access to only licensees and Qualifying Patients. Medical Marijuana Cultivation Facility or manufactured by a Medical Marijuana-Infused Products Manufacturing Facility is sold or otherwise transferred except by a Medical Marijuana Dispensary Facility. The Department shall certify. if possible. at least two commercially available systems to licensees as compliant with its tracking standards and issue standards for the creation or use of other systems by licensees. Manufacturing Facility. a Medical Marijuana Dispensary Facility. a Medical Marijuana Testing Facility. or another entity with a transportation certification. The Department shall develop or adopt from any other governmental agency such safety and security standards as are reasonably necessary for the transportation of marijuana. Any entity licensed or certified pursuant to this section shall be allowed to transport cannabis. C) The Department may charge a fee not to exceed $5,000 for any certification issued pursuant to this section. Establish a system to numerically score competing medical marijuana licensee and certificate applicants. only in cases where more applicants apply than the minimum number of licenses or certificates as calculated by this section. which scoring shall be limited to an analysis of the following: (i) the character. veracity. background. qualifications. and relevant experience of principal officers or managers: (.ii.) the business plan proposed by the applicant. which in the case of cultivation facilities and dispensaries shall include the ability to maintain an adequate supply of marijuana: plans to ensure safety and security of Qualifying Patients and the community. procedures to be used to prevent diversion. and any. plan for making Marijuana available to low-income Qualifying Patients: (jii) site security: (iv) experience in a legal cannabis market: (v) in the case of Medical Marijuana Testing Facilities. the experience of their personnel with testing marijuana, food or drugs for toxins and/or potency and health care industry experience: (vi) the potential for positive economic impact in the site community: (vii) in the case of Medical Marijuana Cultivation Facilities. capacity or experience with agriculture. horticulture. and health care: (viii) in the case of Medical Marijuana Dispensary Facilities. capacity or experience with health care. the suitability of the proposed location. and its accessibility for patients. fix) in the case of Medical Marijuana-Infused Products Manufacturing Facilities. capacity or experience with food and beverage manufacturing: and (pc,) maintaining competitiveness in the marijuana for medical use marketplace. In ranking applicants and awarding licenses and certificates. the Department may consult or contract with other public agencies with relevant expertise regarding these factors. The Department shall lift or ease any limit on the number of licensees or certificate holders in order to meet the demand for marijuana for medical use by Qualifying Patients. State licensing procedures. including procedures for renewals. Such other matters as are necessary for the fair. impartial. stringent. and comprehensive administration of this section. The Department shall issue rules or emergency rules for a medical marijuana and medical marijuana-infused products independent testing and certification program for medical marijuana licensees and requiring licensees to test medical marijuana using one or more impartial. independent laboratories to ensure, at a minimum, that products sold for human consumption do not contain contaminants that are injurious to to ensure correct labeling and measure potency. The Department shall not require any medical marijuana or medical marijuana-infused products to be tested more than once prior to sale. a Medical Marijuana Cultivation Facility, Medical Marijuana-Infused Product Manufacturing Facility. or Medical Marijuana Dispensary Facility. (2) The Department shall maintain the confidentiality. of reports or other information obtained from an applicant or licensee containing any individualized data. information, or records related to the licensee or its operation- including sales information. financial records. tax returns. credit reports, cultivation information. testing results. and security information and plans. or revealing any patient information. or any other records that are exempt from public inspection pursuant to state or federal law. Such reports or other information may. be used only for a purpose authorized by this section. Any information released related to patients may be used only. for a purpose authonzed by federal law and this section. including verifying that a person who presented a patient identification card to a state or local law enforcement official is lawfully in possession of such card. 16) Within one hundred eighty days of the effective date of this section. the Department shall make available to the public license application forms and application instructions for Medical Marijuana Cultivation Facilities. Medical Marijuana Testing Facilities. Medical Marijuana Dispensary Facilities. and Medical Marijuana-infused Products Manufacturing Facilities. Department shall begin accepting applications for such identification cards. Labor. or its successor agency. No more than three Medical Marijuana Cultivation Facility licenses shall be issued to any entity. under substantially common control, ownership. or management. (2) An entity may apply to the Department for and obtain one or more licenses to operate a Medical Marijuana Dispensary Facility. Each facility in operation shall require a separate license. A license shall be valid for three years from its date of issuance and shall be renewable. except for good cause. The Department shall charge each applicant a non-refundable fee of six thousand dollars per license application or renewal for each applicant filing an application within three years of the effective date of this section and shall charge each applicant a non-refundable fee of three thousand dollars per license application or renewal thereafter. Once granted. the Department shall charge each licensee an annual fee of ten thousand dollars per facility license. Application and license fees shall be increased or decreased each year by_ the percentage of increase or decrease from the end of the previous calendar year of the Consumer Price Index. or successor index as published by the U.S. Department of Labor. or its successor agency. No more than five Medical Marijuana Dispensary Facility licenses shall be issued to any entity under substantially common control. ownership. or management. 1_10) An entity may apply to the Department for and obtain one or more licenses to operate a Medical Marijuana-Infused Products Manufacturing Facility. Each facility in operation shall require a separate license. A license shall be valid for three years from its date of issuance and shall be renewable. except for good cause. The Department shall charge each applicant a non-refundable fee of six thousand dollars per license application or renewal for each applicant filing an application within three years of the effective date of this section and shall charge each applicant a non-refundable fee of three thousand dollars per license application or renewal thereafter. Once granted. the Department shall charge each licensee an annual fee of ten thousand dollars per facility license. Application and license fees shall be increased or decreased each year by the percentage of increase or decrease from the end of the previous calendar year of the Consumer Price Index. or successor index as published by the U.S. Department of Labor. or its successor agency. No more than three Medical Marijuana-Infused Products Manufacturing Facility licenses shall be issued to any entity under substantially common control. ownership. or management. CLL) Any applicant for a license authorized by this section may pre-file their application fee with the Department beginning 30 days after the effective date of this section. (_12) Except for good cause. a Qualifying Patient or his or her Primary caregiver may obtain an identification card from the Department to cultivate up to six flowering marijuana plants for the exclusive use of that Qualifying Patient. The card shall be valid for twelve months from its date of issuance and shall be renewable with the annual submittal of a new or updated physician’s certification. The Department shall charge an annual fee for the card of one hundred dollars. with such rate to be increased or decreased each year by the percentage of increase or decrease from the end of the previous calendar year of the Consumer Price Index. or successor index as published by the U.S. Department of Labor, or its successor agency. The Department may set a limit on the amount of marijuana that may be purchased by or on behalf of a single Qualifying Patient in a thirty-day period. provided that limit is not less than four ounces of unprocessed marijuana. or its equivalent. Any_ such limit shall not apply to a Qualifying Patient with written certification from two independent physicians that there are compelling reasons why the Qualifying Patient needs a greater amount than the limit established by the Department. QA) The Department may set a limit on the amount of marijuana that may be possessed by or on behalf of each qualifying patient. provided that limit is not less than a sixty. day. supply. of dried. unprocessed marijuana. or its equivalent. A Primary caregiver may possess a separate legal limit for each Qualifying Patient under their care and a separate legal limit for themselves if they are a Qualifying Patient. Qualifying Patients cultivating marijuana for medical use may possess up to a ninety-day supply. so long as the supply remains on property under their control. Any such limit shall not apply to a Qualifying Patient with written certification from two independent physicians that there are compelling reasons for additional amounts. Possession of between the legal limit and up to twice the legal limit shall subject the possessor to Department sanctions. including an administrative penalty and loss of their patient identification card for up to a year. Purposefully possessing amounts in excess of twice the legal limit shall be punishable by imprisonment of up to one year and a fine of up to two thousand dollars. (_J_5_) The Department may restrict the aggregate number of licenses granted for Medical Marijuana Cultivation Facilities, provided, however- that the number may not be limited to fewer than one license per every one hundred thousand inhabitants. or any portion thereof. of the state of Missouri. according to the most recent census of the United States. A decrease in the number of inhabitants in the state of Missouri shall have no impact. The Department may restrict the aggregate number of licenses granted for Marijuana-Infused Products Manufacturing Facilities. provided- however. that the number may not be limited to fewer than one license per every seventy thousand inhabitants. or any portion thereof. of the state of Missouri. according to the most recent census of the United States. A decrease in the number of inhabitants in the state of Missouri shall have no impact. (_LZ_) The Department may restrict the aggregate number of licenses granted for Medical Marijuana Dispensary Facilities. provided. however. that the number may_ not be limited to fewer than twenty-four licenses in each United States Congressional district in the state of Missouri pursuant to the map of each of the eight congressional districts as drawn and effective on the effective date of this section. Future changes to the boundaries of or the number of congressional districts shall have no impact. CJS) The Department shall begin accepting license and certification applications for Medical Marijuana Dispensary_ Facilities. Medical Marijuana Testing Facilities. Medical Marijuana Cultivation Facilities- Medical Marijuana-Infused Products Manufacturing Facilities. seed-to-sale tracking systems. and for transportation of marijuana no later than two hundred forty days after the effective date of this section. Applications for licenses and certifications under this section shall be approved or denied by the Department no later than one hundred fifty days after their submission. If the Department fails to carry out its non-discretionary duty to approve or deny an application within one hundred fifty days of submission. an applicant may immediately seek a court order compelling the Department to approve or deny the application. (_12) Qualifying Patients under this section shall obtain and annually renew an identification card or cards from the Department. The Department shall charge a fee of twenty-five dollars per year per card with such fee to be increased or decreased each year by the percentage of increase or decrease from the end of the previous calendar year of the Consumer Price Index. or successor index as published by the U.S. Department of Labor or its successor agency. Upon receiving an application for a Qualifying Patient identification card or Qualifying Patient cultivation identification card. the Department shall. within thirty days. either issue the card or provide a written explanation for its denial. If the Department fails to deny and fails to issue a card to an eligible Qualifying Patient within thirty days. then their physician certification shall serve as their Qualifying Patient identification card or Qualifying Patient cultivation identification card for up to one year from the date of physician certification. All initial applications for or renewals of a Qualifying Patient identification card or Qualifying Patient cultivation identification card shall be accompanied by a physician certification that is less than thirty days old. Primary caregivers under this section shall obtain and annually renew an identification card from the Department. The Department shall charge a fee of twenty-five dollars per year. With such fee to be increased or decreased each year by the percentage of increase or decrease from the end of the previous calendar year of the Consumer Price Index. or successor index as published by the U.S. Department of Labor. or its successor agency. Upon receiving an application for a Primary. caregiver identification card. the Department shall. within thirty days. either issue the card or provide a written explanation for its denial. All marijuana for medical use sold in Missouri shall be cultivated in a licensed Medical Marijuana Cultivation Facility located in Missouri. All marijuana-infused products for medical use sold in the state of Missouri shall be manufactured in a Medical Marijuana-Infused Products Manufacturing Facility. (23.) The denial of a license. license renewal. or identification card by the Department shall be appealable to the Administrative Hearing Commission. or its successor entity. Following the exhaustion of administrative review. denial of a license. license renewal- or identification card by the Department shall be subject to judicial review as provided by law. No elected official shall interfere directly or indirectly with the Department’s obligations and activities under this section. The Department shall not have the authority to apply or enforce any rule or regulation that would impose an undue burden on any one or more licensees or certificate holders. any Qualifying Patients. or act to undermine the purposes of this section. Marijuana Dispensary Facility and paid to the Department of Revenue. After retaining no more than five percent for its actual collection costs. amounts generated by the tax levied in this section shall be deposited by the Department of Revenue into the Missouri Veterans’ Health and Care Fund. Licensed entities making retail sales within the state shall be allowed approved credit for returns provided the tax was paid on the returned item and the purchaser was given the refund or credit. Veterans Commission for health and care services for military veterans. including the following purposes: maintenance and capital improvements of the Missouri Veterans Homes. the Missouri Service Officer’s Program, and other services for veterans approved by the Commission. including, but not limited to: health care services. mental health services. drug rehabilitation services- housing assistance. job training. tuition assistance. and housing assistance to prevent homelessness. The Missouri Veterans Commission shall contract with other public agencies for the delivery of services beyond its expertise. All monies from the taxes authorized under this subsection shall provide additional dedicated funding for the purposes enumerated above and shall not replace existing dedicated funding. (2) For all retail sales of marijuana for medical use. a record shall be kept by the seller which identifies- by secure and encrypted patient number issued by the seller to the qualifying patient involved in the sale. all amounts and types of marijuana involved in the sale and the total amount of money involved in the sale. including itemizations. taxes collected and grand total sale amounts. All such records shall be kept on the premises in a readily available format and be made available for review by the Department and the Department of Revenue upon request. Such records shall be retained for five years from the date of the sale. Except as authorized in this subsection. no additional taxes shall be imposed on the sale of marijuana for medical use. (É) The fees and taxes provided for in this Article XVI- Section 1 shall be fully enforceable notwithstanding any other provision in this Constitution purportedly prohibiting or restricting the taxes and fees provided for herein. The unexpended balance existing in the fund shall be exempt from the provisions of section 33.080 relating to the transfer of unexpended balances to the general revenue fund. IL) Except as provided in this section. the possession of marijuana in quantities less than the limits of this section. or established by the Department. and transportation of marijuana from a Medical Marijuana Dispensary Facility to the Qualifying Patient’s residence shall not subject the possessor to arrest. criminal or civil liability. or sanctions under Missouri law. provided that the possessor produces on demand to the appropriate authority a valid Qualifying Patient identification card: a valid Qualifying Patient cultivation identification card: a valid physician certification while making application for an identification card: or a valid Primary caregiver identification card. Production of the respective equivalent identification card or authorization issued by another state or political subdivision of another state shall also meet the requirements of this subdivision. Q.) No patient shall be denied access to or priority_ for an organ transplant because they hold a Qualifying Patient identification card or use marijuana for medical use. Missouri law or discipline by the Missouri State Board of Registration for the Healing Arts. or its successor agency. for owning, operating. investing in, being employed bY3 or contracting with any entity licensed or certified pursuant to this section or issuing a physician certification to a patient diagnosed with a qualifying medical condition in a manner consistent with this section and legal standards of professional conduct. (A) A health care provider shall not be subject to civil or criminal prosecution under Missouri law. denial of any right or privilege. civil or administrative penalty or sanction. or disciplinary action by any accreditation or licensing board or commission for owning. operating. investing in. being employed by. or contracting with any entity licensed or certified pursuant to this section or providing health care services that involve the medical use of marijuana consistent with this section and legal standards of professional conduct. L) A Medical Marijuana Testing Facility shall not be subject to civil or criminal prosecution under Missouri law. denial of any right or privilege. civil or administrative penalty or sanction. or disciplinary action by any accreditation or licensing board or commission for providing laboratory testing services that relate to the medical use of marijuana consistent with this section and otherwise meeting legal standards of professional conduct. (L) A health care provider shall not be subject to mandatory reporting requirements for the medical use of marijuana by. non-emancipated Qualifying Patients under eighteen years of age in a manner consistent with this section and with consent of a parent or guardian. a.) A Primary caregiver shall not be subject to criminal or civil liability or sanctions under Missouri law for purchasing. transporting. or administering marijuana for medical use to a qualifying patient or participating in the patient cultivation of up to six flowering marijuana plants per patient in a manner consistent with this section and generally established legal standards of personal or professional conduct. Marijuana Dispensary Facilities. Medical Marijuana-Infused Products Manufacturing Facilities. Qualifying Patients. Primary caregivers. physicians. health care providers or others related to activity that is no longer subject to criminal penalties under state law pursuant to this section. (2) Actions and conduct by Qualifying Patients. Primary_ Caregivers, Medical Marijuana Testing Facilities. Medical Marijuana Cultivation Facilities- Medical Marijuana Infused Products Manufacturing Facilities. or Medical Marijuana Dispensary Facilities licensed or registered with the Department. or their employees or agents. as permitted by this section and in compliance with Department regulations and other standards of legal conduct. shall not be subject to criminal or civil liability or sanctions under Missouri law. except as provided for by this section. (-10) Nothing in this section shall provide immunity for negligence. either common law or statutorily. created: nor criminal immunities for operating a vehicle. aircraft. dangerous device. or navigating a boat under the influence of marijuana. CLJ_) It is the public policy of the state of Missouri that contracts related to marijuana for medical use that are entered into by Qualifying Patients: Primary Caregivers. Medical Marijuana Testing Facilities. Medical Marijuana Cultivation Facilities. Medical Marijuana-Infused Products Manufacturing Facilities- or Medical Marijuana Dispensary Facilities and those who allow property to be used by those entities. should be enforceable. It is the public policy of the state of Missouri that no contract entered into by Qualifying Patients. Primary Caregivers. Medical Marijuana Testing Facilities, Medical Marijuana Cultivation Facilities. Medical Marijuana-Infused Products Manufacturing Facilities. or Medical Marijuana Dispensary Facilities. or by a person who allows property to be used for activities that are exempt from state criminal penalties by this section. shall be unenforceable on the basis that activities related to medical marijuana may be prohibited by federal law. Nothing in this section shall limit the General Assembly from enacting laws consistent with this section. or otherwise effectuating the patient rights of this section. The legislature shall not enact laws that hinder the right of Qualifying Patients to access marijuana for medical use as granted by this section. Bring a claim against any employer. former employer. or prospective employer for wrongful discharge. discrimination. or any similar cause of action or remedy. based on the employer. former employer. or prospective employer prohibiting the employee, former employee. or prospective employee from being under the influence of marijuana while at work or disciplining the employee or former employee. up to and including termination from employment. for working or attempting to work while under the influence of marijuana. [2) No Medical Marijuana Cultivation Facility- Medical Marijuana Testing Facility. (g) More than five years have passed since the person was released from parole or probation. and he or she has not been convicted of any subsequent criminal offenses. The Department may consult with and rely on the records. advice and recommendations of the Attorney General and the Department of Public Safety. or their successor entities. in applying this subdivision. G.) All Medical Marijuana Cultivation Facility. Medical Marijuana Dispensary Facility. and Medical Marijuana-Infused Products Manufacturing Facility licenses: entities with Medical Marijuana Testing Facility certifications: and entities with transportation certifications shall be held by entities that are majority owned by natural persons who have been citizens of the state of Missouri for at least one year prior to the application for such license or certification. Notwithstanding the foregoing. entities outside the state of Missouri may own a minority stake in such entities. (A) No Medical Marijuana Cultivation Facility. Medical Marijuana Dispensary Facility- or Medical Marijuana-Infused Products Manufacturing Facility shall manufacture. package or label marijuana or marijuana-infused products in a false or misleading manner. No person shall sell any: product in a manner designed to cause confusion between a marijuana or marijuana-infused product and any product not containing marijuana. A violation of this subdivision shall be punishable by_ an appropriate and proportional Department sanction. up to and including loss of license. “Marijuana-Infused Product.” Violation of this prohibition shall subject the violator to Department sanctions. including an administrative penalty. (L) No individual shall serve as the Primary caregiver for more than three Qualifying Patients. E) No Qualifying Patient shall consume marijuana for medical use in a public place. unless provided by law. Violation of this prohibition shall subject the violator to sanctions as provided by general law. (3) No person shall extract resins from marijuana using dangerous materials or combustible gases without a Medical Marijuana-Infused Products Manufacturing Facility. license. Violation of this prohibition shall subject the violator to Department sanctions. including an administrative penalty and. if applicable. loss of their identification card- certificate or license for up to one year. (2) All Qualifying Patient cultivation shall take place in an enclosed. locked facility that is equipped with security devices that permit access only by the Qualifying Patient or by such patient’s Primary caregiver. Two Qualifying Patients- who both hold valid Qualifying Patient cultivation identification cards: may share one enclosed. locked facility. No more than twelve Qualifying Patient or Primary caregiver cultivated flowering marijuana plants may be cultivated in a single. enclosed locked facility except when a Primary caregiver also holds a Qualifying Patient cultivation identification card. in which case no more than eighteen flowering marijuana plants may be cultivated in a single. enclosed, locked facility. Q_Q) No Medical Marijuana Cultivation Facility. Medical Marijuana Dispensary Facility. Medical Marijuana-Infused Products Manufacturing Facility. Medical Marijuana Testing Facility. or entity with a transportation certification shall assign. sell. give. lease. sublicense. or otherwise transfer its license or certificate to any other entity without the express consent of the Department. not to be unreasonably withheld. Facilities. or entitles with a transportation certification either expressly or through the enactment of ordinances or regulations that make their operation unduly burdensome in the jurisdiction. However. local governments may enact ordinances or regulations not in conflict with this section. or with regulations enacted pursuant to this section. governing the time. place. and manner of operation of such facilities in the locality. A local government may establish civil penalties for violation of an ordinance or regulations governing the time. place: and manner of operation of a Medical Marijuana Cultivation Facility. Medical Marijuana Testing Facility. Medical Marijuana-Infused Products Manufacturing Facility. Medical Marijuana Dispensary. Facility, or entity holding a transportation certification that may operate in such locality. (E) Unless superseded by federal law or an amendment to this Constitution. a physician shall not certify a qualifying condition for a patient by any means other than providing a physician certification for the patient. whether handwritten. electronic. or in another commonly used format. A Qualifying Patient must obtain a new physician certification at least annually. (JA) Nothing in this section shall be construed as mandating health insurance coverage of medical marijuana for Qualifying Patient use. CJS) Real and personal property used in the cultivation. manufacture. transport. testing: distribution. sale. and administration of marijuana for medical use or for activities otherwise in compliance with this section shall not be subject to asset forfeiture solely_ because of that use. The provisions of this section are severable. and if any clause. sentence- paragraph or section of this measure- or an application thereof. is adjudged invalid by any court of competent jurisdiction. the other provisions shall continue to be in effect to the fullest extent possible. The provisions of this section shall become effective on December 6. 2018. Saturday and Sunday at the KCI Expo Center next to the Gun Show. Tickets Available now on Eventbrite FREE. KANSAS CITY, MO – Mike Arnold is pleased to announce that he and Jessica Anderson of Natural Wellness on North Oak near Aldi (in Gladstone) are hosting a comprehensive pre-election industry seminar Friday, October 26th to Sunday the 28th. Co-host Victory Garden brand is underwriting the tickets. It’s now time for Mike to continue educating his hometown on how to capitalize on this emerging market before the East and West Coast carpetbaggers try to get their piece of the Midwest agricultural birthright. He will explain the essential knowledge and common missteps. With three Missouri initiatives on the ballot in November, now is the time to plan for your family farm’s future or to plan your investment and operations strategies. Mike is hoping to help MO be ready to roll by 2019. Let’s not forget that Kansas growing in 2019, so now is the time to purchase seed! There will be hundreds of thousands of acres being cultivated next year, so don’t wait! Scaling any product is difficult, particularly a “new” one to an area (or at least new to a generation of farmers). However, it is possible with prior proper planning. Mike is an experienced entrepreneur and has built several successful businesses from the ground up. He started his own law firm and worked on several high-profile cases attracting national attention before following his dreams of becoming a farmer. His seminar will include the backstory on how this KCMO boy quit the practice of law at the peak of his career to pivot into this new industry. Click on the home page of this site for curated press coverage of Mike’s nationally-publicized cases. Pain, PTSD, and stress. There is no magic bullet for these despite the big pharma and big alt medicine hype. A healthy lifestyle and diet typically wins the day. However, there are alternatives out there to traditional analgesic and narcotic pain relief and several are available in Kansas City, Missouri already. Checkout Natural Wellness on North Oak for a particlar “See Bee Dee” plant-based supplement. Pooling resources and assets is what a corporation is all about. None of the shareholders can create something of lasting value on their own but together they can. The sum of all of our capital is greater than its parts. This is also the beauty of investment funds. Where a group of like minded investors can put together their money and get more bang for their buck. They can leverage their collective investment purchasing power and leverage better terms as a group versus doing it individually. The danger begins when capital is being pooled but when any of the contributors loses control of their own money. When that occurs and the investor is a passive investor relying on the others, they have probably now purchased a security in the investment group and the “club” leader is now an investment adviser with a set of securities regulations to abide by. If you are uncertain about whether or not your group is towing the line, contact a securities lawyer. This is typically worth the $400 or so for an hour of attorney time just to bounce ideas off of them and get some advice. Even if you don’t change your investment plan or fundraising strategy, you will probably learn something for a seasoned securities lawyer that will make your investment club better at what they do. Should You Take Your Marijuana Company Public? In 2016, I saw major marijuana consolidation on the horizon nationwide in the recreational marijuana industry and definitely in Oregon. Why should four different Oregon cannabis companies have four different delivery drivers, managers, CEOs, CFOs, etc.? Why buy supplies separately when you could pool the buying power of a consolidated powerhouse? Consolidation decreases duplicative inefficiencies and ultimately the consumer wins with lower prices. Also, why should a cannabis company have to learn from scratch delivery logistics when there is an alcohol distributor in every town that already knows how to sling psychoactive organic chemicals made by plants and is already servicing state liquor licensees. Another possibility is that the big marijuana players of Canada and the US West Coast will quickly consolidate over the next 18 months and WEED WILL ACQUIRE ALCOHOL thereafter, picking off a few distributors here and there and then continuing to merge. Guess what this could mean: It is possible that Big Weed becomes bigger than anything else as alcohol loses consumer dollars everyday to new cannabis consumers looking for a healthier lifestyle or opiate users switching to THC at a huge loss to Big Pharma. The future is exciting to speculate about and will be even more exciting to live through and be part of. The next Apple or Microsoft or Google or Nike exists out there somewhere in cannabis land. There is someone you’ve never heard of before that will be the first Mark Zuckerman of cannabis. I love this industry! While no forward-looking statements were intended and this blog post is just the private, personal musings of Mike Arnold, certain information set forth herein may be construed as “forward-looking information”, including “future oriented financial information” and “financial outlook”, under applicable securities laws (collectively referred to herein as forward-looking statements). Information contained herein is not intended to constitute forward-looking statements nor does it contain any of the following (i) projected financial performance of the Company; (ii) completion of, and the use of proceeds from, the sale of the shares being offered hereunder; (iii) the expected development of the Company’s business, projects and joint ventures; (iv) execution of the Company’s vision and growth strategy, including with respect to future M&A activity and global growth; (v) sources and availability of third-party financing for the Company’s projects; (vi) completion of the Company’s projects that are currently underway, in development or otherwise under consideration; (vi) renewal of the Company’s current customer, supplier and other material agreements; and (vii) future liquidity, working capital, and capital requirements. Forward-looking statements are provided to allow potential investors the opportunity to understand management’s beliefs and opinions in respect of the future so that they may use such beliefs and opinions as one factor in evaluating an investment. While this is Mike’s personal opinion at this moment, none of this should be taken as fact nor as a permanent opinion. These statements are not guarantees of future performance and any reliance should not be placed on them. Forward-looking statements are speculative and necessarily involve known and unknown risks and uncertainties, which may cause actual performance and financial results in future periods to differ materially from any projections of future performance or result expressed or implied by such forward-looking statements. Although forward-looking statements contained in a placement memorandum may be based upon what management of the Company believes are reasonable assumptions, there can be no assurance that forward-looking statements on a blog post will prove to be accurate, as actual results and future events could differ materially from those anticipated in such statements. The Company undertakes no obligation to update this blog at any time if circumstances or Mike’s opinions should change except as required by applicable securities laws. The reader is cautioned not to place any reliance on forward-looking statements in a blog post. That would be crazy and irresponsible. Do your own research and make your own opinions. In March of 2017, my cannabis company had no cananbis and no assets. I had ideas and a never-fail attitude. We willed into existence leases, capital, employees, plants, and then revenue. 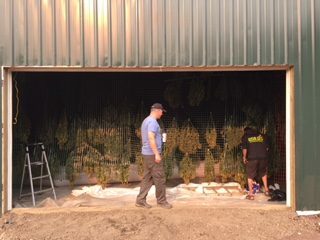 Mike designed the drying barn to dry thousands of plants at a time.